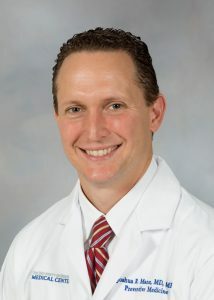 Joshua Mann, M.D., completed his undergraduate degree at Delta State University in Cleveland, Mississippi, before earning his medical degree from the University of Mississippi School of Medicine in 1996. He completed his residency training in public health and general preventive medicine and a Master of Public Health degree at the University of South Carolina in 1999. He was a faculty member at the University of South Carolina School of Medicine from 2002 until 2015, serving as medical director of student and employee health and preventive medicine residency director. In 2015, he joined the University of Mississippi Medical Center as chair of the new Department of Preventive Medicine. Mann is an active researcher, having authored or co-authored 75 scientific articles focusing on a range of topics including the health of people with disabilities, prenatal risk factors for childhood disabilities, and associations of religious/spiritual factors and social support with antenatal and postpartum anxiety and depression.